Among the renowned Siva kovils which emerged in various parts of Ilankai, Munnicuvaram kovil at Cilapam in the western part of Ilankai was prominent and extolled as a kovil of great antiquity. The presiding deity is called Śrī Munnainathar ('Lord of antiquity') and the goddess is Sri Vativampika Devi (�goddess of beautiful form'). Munnicuvaram being a great Saiva shrine became a centre of highest devotion where people of various categories paid homage to the presiding deity. Thus this is extolled as a sacred site (punya ksetra), and renowned for its murti, ('deity'), sthala ('sacred place'), and tirtha ('sacred ford') aspects. In addition to its mythological significance having a tradition of epics and puranas, the kovil has a long and significant history. The ancient tradition of this kovil has attracted the kings who reigned in different periods. The inscriptions attached to this kovil bore record to the wealth which the successive kings with true devotion provided to the regular service of the kovil. This kovil appears to be one of the important temples in the territory of Kotte in the fifteenth century. The Tamil inscription of the Parakramabahu VI (1412�-1467) found in Munnicuvaram reflects the patronage extended by this king by granting land and money to the kovil and its brahmin priests. The king took interest in the reno�vation of the kovil too. The kovil is mentioned in the Kokila Sandesaya which was written in his reign, and we can presume that this kovil would have had a long tradition and its origin would go back to a period earlier to this King. The royal patronage to the kovil of Munnicuvaram continued until the 16th century, and during this period another ruler of Kotte Parakramabahu IX (1509-1528 A.D.), donated extensive lands to the kovil by recording in a copper plate inscription. It records his visit to this kovil and the endowment. It is worthwhile to mention here that any donation or contribution for renovation of a Saiva kovil is honoured as a 'holy act' (punya karya) in Saiva tradition. Since this kovil is claimed to be an ancient one, the kings and the people would have developed a high devotion and these grants reflect as the token of their devotion. As a result of this Munnicuvaram attracted more devotees who visited on pilgrimage and attained similar prominence to that of Tirukkoneccuram. At the same time it developed to be a centre for Saiva religious and cultural activities and rituals were performed in accordance to the prescribed form. More communities were settled around the kovil to attend to the various activities of maintenance of this great kovil. The renovation activities and the consecration ceremonies are said to be the special features in the history of the kovils. The devastated Munnicuvaram kovil was renovated in the eighteenth century by the Nuvaran King Kirti Śrī Rajasinha (1747-1782 A.D.) and the kumbhabhiseka ceremonies were performed in the year 1753. For the regular per�formance of the daily and special rituals of the kovil, he made a grant of extensive lands to the priests of the kovil, through a copper plate in the same year. The maintenance of this kovil later became the responsibility of the priests. N. Coomaraswamy Kurukkal (1816-1909 A.D.), who was a leading priest attached to this lineage of priests of this kovil, took a great initiative to renovate the main sanctum (garbhagrha, 'womb-house'), the main hall (mahamandapa), and the semi-hall (ardha-mandapa) and performed the consecration of the kovil in 1875 A.D.
During the period of M. Somaskanda Kurukkal (1886-1940) of this kovil, a kum�bhabhiseka ceremony was held under his guidance and leadership in 1919. It is appro�priate here to mention about the priesthood who were the custodian of agamic tradition and we can mention the contributions of M. Somaskanda Kurukkal as an example. He was well versed in vedic and agamic texts, paddhatis (ritual manuals), grammar and philosophy. He possessed a good knowledge in the fields of silpa-texts and was familiar with the prescriptions of image-making. He was an exponent in performing the special rituals in kovils and widely performed kumbhabhiseka in the major kovils in Ilankai. 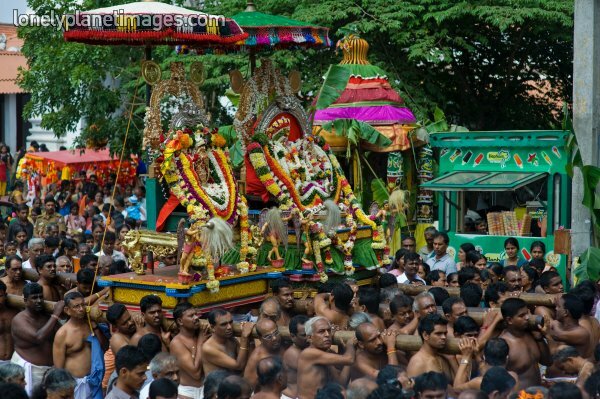 He had travelled widely in India and witnessed the kumbhabhiseka rituals performed there. He had initiated fruitful discussions with the priests versed in agamic ritual traditions. It is worth to mention here that during this period, he contributed by holding the position of chief-advisor (sarvabhodaka, 'one who is skilled in all the rituals'), in the kumbhabhiseka ceremony held in Śrī Meenakshi Sundaresvara kovil. This is a clear inci�dent which shows that the agamic traditions were prevelant in kovils both in South India and Ilankai. 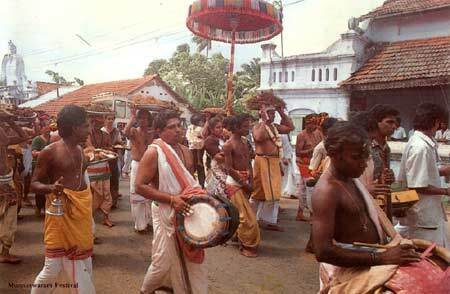 The priests from Ilankai too were honoured in South India for their versatility in agamic rituals. In maintaining the traditions of this kovil, another kumbhabhiseka was performed in this kovil on a grand scale in July, 1963, during the adminstrative pe�riod of S. Balasubramania Kurukkal, after completing the main renovations In the kovil. The kumbhabhiseka of this kovil (which forms the special aspect of this paper) was performed on 4th July 1991, under the supervision and guidance of Prof. K. Kailacanata Kurukka. In analysing these historical events in this kovil, we can say that this kovil has stood as a centre for maintaining the Saiva traditions and agamic ritual systems. Also we are in a position to know the lineage of the priesthood that has contributed to the de�velopment of this kovil tradition. This kovil stands as a great monument surrounded by various other small shrines. To the south-east of the kovil is one kovil dedicated to Vinayakar ('the god who has no Lord above'). A kovil dedicated to Aiyanar ('deity of reverence') is situated in the northeast corner of the third path-way of the kovil. The Kali (black-goddess) kovil stands m the northern part of the chariot pathway and in the southern direction of the outer courtyard of this kovil is situated another Vinayakar kovil. Thus this area is honoured by the devotees as a sacred place. The kovil that faces to the east consists of three pathways around it. A sacred pond is situated in front of the kovil and a Bo-tree stands by the side of it, glorified as the tree of the kovil (sthala vrksa). The main sanctum here is the one which is largest in comparison to other kovils in Ilankai, and finial in the structure above the sanctum (vimana 'the one which is well measured') is also large in proportion. The various architec�tual aspects of this kovil conform to the prescriptions laid down in the agamas. The garbhagrha and the adjoining hall (ardha mandapa) are built in granite stone keeping to the traditional art of kovil building. Siva linga is installed in the main sanctum of this kovil, which is also large in size. Siva as the undivided causal principle is worshipped in the linga. His more manifest as�pects are represented in various other images. The linga represents the male aspect and the pitha as a yoni represents the female principle complementing the male principle of linga; both together reflect the Siva-Sakti concept. In Saiva tradition the linga is the most sacred and highly venerated object. Hence Siva linga is installed in the garbhagrha 'womb-house' of any Siva kovil. The daksina murti ('the god facing the south') is installed in the southern direc�tion of the outer wall of the main sanctum, the sculpture of which is one of the best pro�duction of a skilled artist. The lingodbhava murti ('the god manifests in the linga') is enshrined in the western wall of the main sanctum. A separate shrine is dedicated to Sakti who faces to the south. Separate shrines are allocated for the surrounding deities (parivara devatas), such as Vighnesvara (�Lord of Obstacles'), Murukan, Turk�kai (Durga: 'Goddess who is difficult to transgress'), Visnu and Bhairava (�terrific form'). Candesvarar is installed in an independent shrine in the northeast of the main sanctum. Lord Nataraja ('Dancing King') is in bronze idol enshrined in a separate hall. A kovil for the nine planets (navagraha) also finds a place in the hall adjoining the sthambha mandapa (flagstaff hall). Another special aspect to be mentioned is the installation of the bronze icons of 63 devotees of Siva (Civan-atiyars), in a shrine room. There are other forms of Siva: Candrasekhara murti,(the god with the crescent moon as the ornament in the hair'), Bhiksatana (�roaming beggar'), and Somaskanda ('the god with Uma and Skanda), in bronze are installed for worship. (flagstaff hall), vasanta-mandapa (spring hall), and yaga-sa1a (sacrifice hall), reflecting the architectural aspect of this kovil. There are six daily worships (pujas) held and vari�ous special rituals are performed according to the agamic prescriptions. � B. Sivaramakrishna Sarma, Śrī Munnesvara Varalaru [The History of Śrī Munnesvaram Temple] (Colombo: The Colombo Co-operative Printers' Society Ltd., Colombo,1968), p. 4 ff. See also C. Rasanayagam, Ancient Jaffna. (First published in 1926) (New Delhi: Asian Educational Services, New Delhi, 1984), p. 83: M. Somaskanda Kurukkal, Śrī Munnesvara Manmiyam, [The Glories of Śrī Munnesvaram] (Colombo Virakesari Printers, Colombo, 1949), pp. 13-34. �S. Pathmanathan, "Buddhism and Hinduism in Sri Lanka: Some points of contact between two religious traditions (circa A.D. 1300-1600), Lanka, No 4, ed. Peter Schalk, March, 1990. pp.102-103. Also see P.E. Peiris, "Nagadipa and Buddhist Remains in Jaffna", Journal of the Royal Asiatic Society of Ceylon Branch, XXVI, No. 70, (1917), pp. 17-18. B. Sivaramakrishna Sarma, op. cit., pp.50-51. S. Pathmanathan, "Buddhism and Hinduism in Sri Lanka: Some points of contact between two religious traditions" (circa A.D. 1300-1600), loc. cit. S. Somaskanda Kurukkal, op. cit, p. 36. Ibid., p. 37. Also see B. Sivararnkrishna Sarma. op. cit., p. 10. B. Sivaramakrishna Sarma, op. cit, p.10. Somaskanda Kurukkal, op. cit., p. 38. The title 'kurukkal' is given to a priest who has gone through the expected initiation to become a chief priest, well versed in performing the special rites of the temple. B. Sivararnakrishna Sanna, op. cit., p. 40. Also ref. K. Kailasanatha Kurukkal, Caivauirukkovir kiri�yai neri [Ritual traditions of Saiva Temples] (Colombo: The Hindu Literary Society, Colombo. 1963). pp. vii-xii. For a detailed discussion on the process of kumbhabhiseka held in 1963, see Śrī Munnesvaram Sri Vativambika sameda Munnanatha Swamy Devasthana Maha kumbhabhiseka Souvenir (Munnesvaram, 1963), pp. 70-78. K. Kailasanatha Kurukkal, Professor Emeritus and a scholar in Sanskrit, is well versed in the theory and practical aspects of temple rituals and agamic traditions.